ESD Tech GFCI Wall Outlet Receptacle – 20 Amp, 125V, Self-Test, Tamper Resistant Decora Duplex with Dual LED Indicator Lights. New UL 2015 Listed. Wall Plate Included. 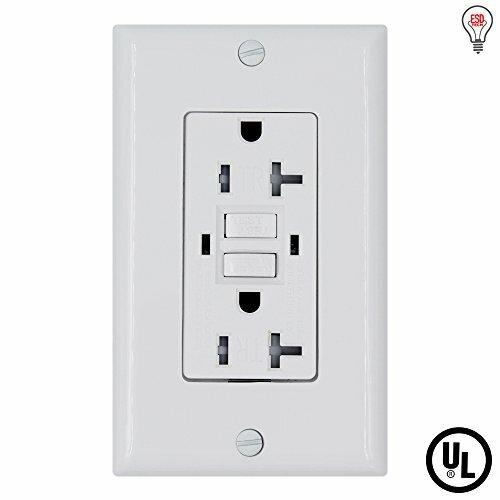 Our GFCI Outlets have an automated self-testing function. The device automatically runs tests to detect any issues. If it fails the test, then the indicator lights will flash, notifying you to push the RESET button. If this keeps occurring, you will instantly know that the receptacle needs replacement. Our product is also designed with tamper-resistant shutters which block all foreign objects to be inserted into the outlet. Each package comes with 1 receptacle, a wall plate, and screws. Our GFCI receptacles are ETL listed (UL Equivalent) to meet the safety standards required in North America. Because we are so confident in our product, each purchase comes with a warranty of up to 5 years. Your satisfaction is our top priority. ✅ SELF TEST FOR SAFETY – This receptacle periodically runs automatic testing to ensure the ground fault circuit interrupter (GFCI) electronics are functional. If there is a problem that is detected, the indicator light will flash, notifying you to press the Reset button. Self testing occurs every few minutes. You can manually test at any time. ✅ UL 2015 (ET EQUIVALENT) LISTED – Compliant with recently updated safety standards required for sale and installation in North America. ✅ DOUBLE LED INDICATOR – Easily tell if the GFCI is working properly depending on the color of the LED Indicator lights.